Doug McCall, a brother of the owner, and judge Eualie Thwaites, with the Southdown ram which won the Supreme Sheep Award at the Southland A&P Association’s 150th Show in Invercargill on Saturday. 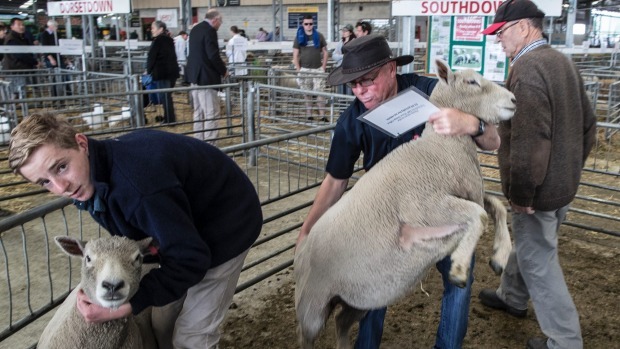 A cricket game at Waikoikoi prevented Ross McCall from being on hand to receive the trophy for the Supreme Sheep Award at the Southland A&P Show in Invercargill on Saturday. McCall, who along with his wife Tracey are sheep breeders at Waikoikoi, was playing for his local cricket club. However, the luck he had at the show didn’t stretch to Waikoikoi and the home team lost to Central Western. He and his brother Doug, of Benio, brought the family’s entries to the show on Saturday morning and then Ross returned home. The Southdown ram, owned byMcCall, and Tracey and David Somerville, of Pine Bush, won four awards on Saturday – Supreme, Age Group, Champion Southdown and Meat Cup. “He was a point off winning the supreme award at the Wyndham show [in December],” said McCall, a fifth generation farmer. Winning the top award on Saturday provided hi m with his fourth supreme title at shows. His brother Doug said the ram had strong qualities. Saturday was the first Southland A&P Association Show McCall had entered sheep in since the annual event was moved from the Invercargill Showgrounds 10 years ago. The main reason for his absence was that it clashed with him playing cricket for the Waikoikoi club, of which he became a life member in January. Southdown breeder Chris Medlicott is pleased his young ram made $9000. A $9000 ram topping a ram and ewe sale in Christchurch has made southdown breeder Chris Medlicott a happy farmer. The southdown sire was well ahead of the 244 ram and 28 ewe field for the Canterbury A&P Association Elite Ram and Ewe Sale last week. The top ram hogget from the mainly meat breed was bought by Winton southdown breeders Todd and Fleur Anderson, who have previously sourced Medlicott for their southdown bloodlines. 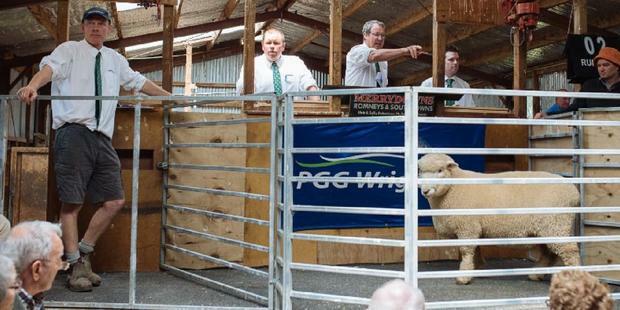 Chris Medlicott, from Waimate, has held the world record for selling a $16,000 southdown ram. Medlicott’s Clifton Downs Southdown stud is in Waimate and he is no stranger to topping sale prices over the past 10 years at the ram auction. In 2005 he broke the world record for a $16,000 southdown. He said the ram hogget had performed well at the Canterbury A & P Show, winning the single ram hogget class and the all-breeds meat ram hogget section. Medlicott said it had not been difficult letting the young ram go because that was his job as a southdown stud breeder. Medlicott sells his elite rams at the Canterbury A&P Association sale and sold all seven of the ram hoggets he offered, including a sire bought for $4000 by Ross McCaw and another ram which will end up being delivered to Argentina. He sells about 80-90 ram hoggets a year with the others sold privately to buyers from Canterbury, Otago and some to Southland and parts of the North Island such as Hawke’s Bay. He said the southdowns commanded high prices because of their good traits including their ability to get lambs away before the meat schedule drops. The average sale price was $1678 for 145 rams sold at the auction and $379 for 19 ewes. Total sales amounted to $250,500 after the final bid was taken. The closest contender to the Medlicott ram was a texel from Culverden’s Sam Holland making $6500 and another southdown made $6500, belonging to Willowhaugh Enterprises from Blenheim. The southdowns had a good run with a Midlands ram sold by Dave Gillespie from Oxford making $5200. Other top prices were a south suffolk making $5400 from SJ Sinclair of Ashburton, a corriedale for $2200 from Wattlebank, GR & RW Wilson at West Melton, a hampshire for $3600 from La-Mac, BJ & PE Butterick at Tai Tapu and a romney for $5000 from Gatton Park, DA & SJ Wyllie at Ashburton. The best border leicester made $2500 from Alyth, IR Caird at Timaru, a suffolk for $6000 from Collie Hills, Collie Hills Partnership at Kurow and another suffolk for $5000 from Taronga, SW Howard at Lawrence and a dorset down for $4000 from Belview, JP & WN Dodd at Oamaru. Canterbury A&P Association sheep committee member Graham Sidey said sought after rams had sold at impressive prices and the overall result was positive. The total tally was the lowest for the past five years, including a $306,000 peak in 2013 when the ram average was $1867. PGG Wrightson senior auctioneer John McKone sells a ram at the Merrydowns Romney and Southdown ram fair at Waikoikoi last week. Blair and Sally Robertson sold 194 rams as far afield as Warkworth for an average price of $1130. Romney rams ranged from $600 to $3800, the top priced ram purchased by Peter and Diane Lowe from Ashburton, and Southdown rams sold from $450 to $3000. Mr and Mrs Robertson, who have the largest Southdown breeding flock in Australasia and the largest registered Romney breeding flock in the South Island, were pleased with the sale result. The focus at Merrydowns was on keeping the breeds pure with no cross-breeding, Mr Robertson said. 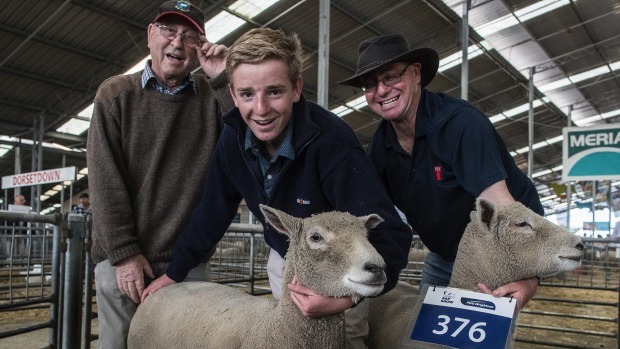 The southdown farming trio of Leo Christey, left, Mark Christey, 16, and Andrew Christey. It’s a good job there is no school exam clash for Mark Christey during the Canterbury A&P Show. Mark is the third generation of his Southbridge family to lead southdown sheep into the judging ring at the annual event. He accepts school comes first and the show second, but it is a close-run thing. Three generations of sheep exhibitors – Mark Christey, left, Andrew Christey and Leo Christey. “Exams are starting today, but not for me. They start on Monday for me, but last year I had to go home for an exam on Thursday. The 16-year-old from Ellesmere College is in his element in the sheep pens and looks forward to show day each year. “It’s good to get out and see what other people are doing compared with Dad at home,” Mark said. At the show are his grandfather Leo, who started the family’s Mapua Southdown Stud in 1963, and grandmother Leonie, a show stalwart. ​Alongside them are father Andrew, sister Sarah with mother Louise an integral part of the farming family. Each member is involved in their 100 hectare farm which combines mixed cropping with 220 sows, cow grazing, a commercial sheep flock and the prized 130 ewe stud. Their best show result was top drawer ribbons in the southdown carcass evaluation class and best pair of rams several years ago but since then the wins have been elusive and they have had to settle for second and third placings. Andrew said his father, Leo, started the stud to breed a “fast fattening” lamb and it continued to meet this criteria with southdowns since developing into a premier meat breed. Andrew is no stranger to attending the show himself and enjoys the camaraderie, family outing and the competition. The family farm was bought in 1919 by Mark’s great, great grandfather Jack. Unsurprisingly, the “dream goal” is for Mark to take over the intensively-run operation after tertiary studies. He helps with lambing and checking the ewes and is starting to assist his father with selecting stud rams. With his family pedigree, it is not any surprise that Mark is a big supporter of the southdown breed. 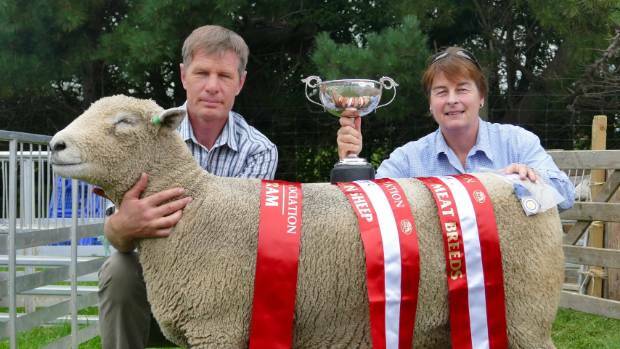 24-year-old Corey Prouting is one of the youngest Southdown stud breeders in New Zealand. 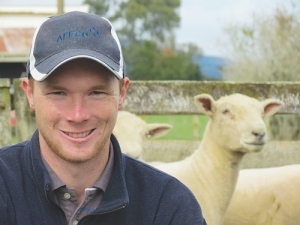 At just 24 years of age Corey Prouting is making a name as a Southdown stud sheep breeder. While his operation is relatively small he is following in the family tradition as a breeder of excellent terminal sires. Prouting’s 100HA farm is just north of Levin, in an area of mostly dairying and horticulture, with few commercial sheep operations. The farm is largely flat and beyond it rise the distant Tararua Ranges, a natural barrier that keeps the area wet, so it handles the summer dry well. The property has been owned by the family since the 1920s and Corey Prouting is the fifth generation to run the farm. The first owners, his great grandparents, ran mostly Southdown’s. His grandmother started the stud in 1943 and passed it to Corey to manage in 2009. Since boyhood Prouting showed a great interest in the farm. “In the weekends I’d help my grandparents on the farm and I enjoyed this. After I left secondary school – Waiopehu College (also Minister for Primary Industries Nathan Guy’s school) – I spent a year doing the farming course at Otiwhiti station in 2009,” he told Rural News. 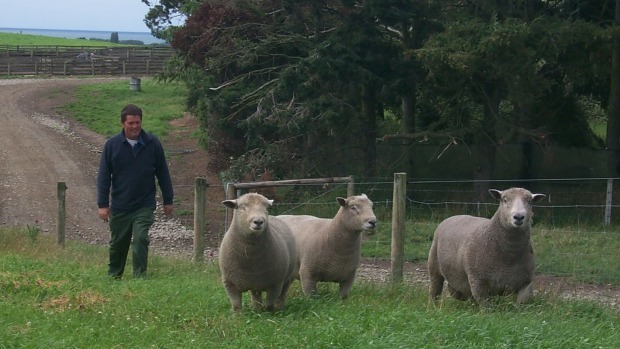 Once through the Otiwhiti course, Prouting took over managing the Southdown stud. 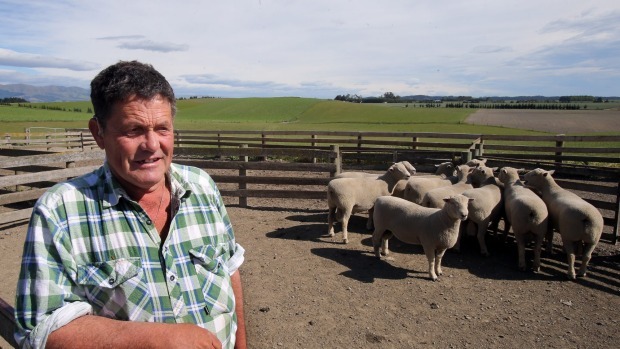 He runs 65 breeding ewes and each year sells about 25 rams to buyers in the North Island. His grandparents started this and he continues. While Prouting has specific responsibility for the Southdowns, his grandparents run other stud sheep on the farm – Cheviots, Polled Dorsets, Perendales and Romneys and – he helps them with these as well. The part of the farm where the Southdowns are run was first a dairy farm, but was converted to sheep about 20 years ago. “I like the characteristics of Southdowns: they are very quiet animals, easy to deal with and are good mothers. Their lambs have low birthweights so there are no lambing problems but then they have very quick growth rates,” Prouting explains. This season has been a tough one for all farmers in Horowhenua. There was a lot of rain, frosts came early and the grass has not grown as well as in past seasons. Normally Prouting relies only on grass but this year he had to feed baleage to keep the ewes in good condition leading up to lambing. Showing his stud Southdowns and generally becoming involved in the Southdown Society has been an interest Prouting has pursued since he took over the stud. A few years ago he won the ewe hogget class at the Royal Show at Palmerston North. This year he won the supreme champion ram at the Levin A&P show. He says showing is good because it enables you to benchmark your stock against others and help think of new ways of managing the stock. But the interest in showing his stock has led to another opportunity – judging. Prouting is keen to pursue a career as show judge and says he’s had lots of support from the Southdown Society. Last year, they invited him to be junior judge and he’s keen to see where this will lead. At just 24, Prouting is among the youngest Southdown stud breeders in the country. He’s keen to continue this and is working hard to buy his own farm. “At $5/kg a 17kg lamb brings $85,” he explains. “Lambs left after the December 10 weaning draft – with an average liveweight of 28kg — at a store value of $2.40/kg bring $67.20 per head. “But when these lambs reach an average kill weight of 17kg by January 12 it equates to a return of only 28 cents per kilo of drymatter consumed. 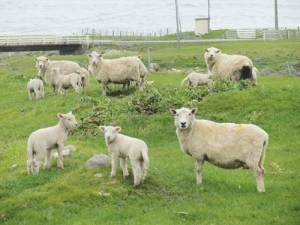 “Getting lambs away early is one of the strengths of the Southdown breed. A really positive attribute of the Southdown is they don’t suffer a weaning check, so you can be back drafting soon after weaning. Legacy . . . Henry Andrew set the standard for Southdown rams with the likes of this champion. This image was painted from a photograph from the 1960s and hangs in the Punchbowl homestead. 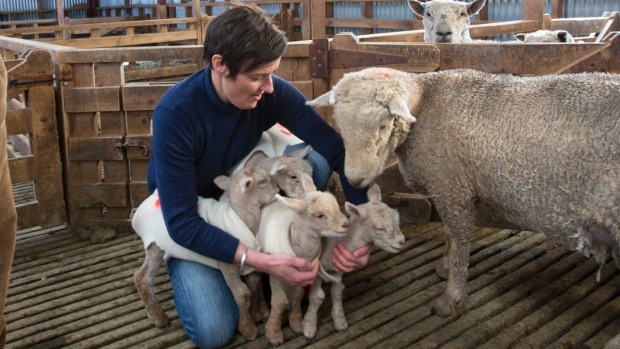 A century of ram breeding has been celebrated at North Otago’s Punchbowl Farm. Doug and Jeannie Brown have been living at the property near Maheno since 1989, continuing the family farming business established by Mr Brown’s maternal grandfather, Henry Andrew, in 1915. Mr Andrew spent 70 years on the land, crafting a reputation as a breeder of exceptional Southdown sheep. In a 1977 edition of N.Z. Meat & Wool, writer R.M. Moir said ‘‘. . .it would be very hard to place anyone above Mr H.J. Andrew in the field of improving New Zealand’s livestock’’. ‘‘His contribution to our farm production, through his work of improvement in Southdown sheep, has been of tremendous importance and must place him among the greatest sheep breeders seen in New Zealand,’’ the article said. It credited Mr Andrew for keeping this country at the top of the world export lamb market. The flock was founded with ewes from H. Pannett and J.B. Reid, and rams imported from England. Mr Andrew dominated sheep shows for decades. Even after he stopped exhibiting his stock, championships were won by their progeny. Punchbowl rams set world record prices for Southdowns at the Feilding Stud Ram Fair in the 1940s and 1950s. From 1964, when Mr Andrew began holding his own annual sale at the farm, the prices paid were often the highest of the year for the breed. Punchbowl sheep were exported to England, the United States, Australia, and Japan. Mr Brown said his grandfather was ‘‘a perfectionist’’, with the farm immaculately tidy. Most of the fence posts on the property were painted white, which was possible in times of abundant labour. Mr Andrew dispersed his Southdown stud in 1978 and his Poll Dorset stud about 1984. When the Browns moved into the Punchbowl homestead, they continued to develop the Suffolk stud they had already founded. They also breed Poll Dorsets. ‘‘Suffolk and Poll Dorset rams are dominant breeds in the Central Progeny Test for outstanding growth to weaning with 15 out of the top 25 sires being from these breeds,’’ Mr Brown said. The Browns have crossed both the Suffolk and Poll Dorset with Texel to produce lambs that perform well in areas with dry summers. They mature early and are hardy and high-yielding. Today’s Punchbowl rams are the progeny of more than 1000 SIL (Sheep Improvement Ltd) recorded ewes, with only the top 30% retained for sale. Most clients are in South Canterbury and North and East Otago’s eastern dryland, where conditions are similar to Punchbowl’s. Mr Brown said sheep farming got harder as ewe numbers dropped, but ‘‘big production gains’’ in recent decades had helped to hold up the industry in terms of meat output. The Browns planned to continue breeding rams, but were also branching out by investing in the North Otago Irrigation Company’s expansion. A block of land near Totara would be watered from September next year with two centre-pivots. The land use was not yet decided, but could include more lamb finishing and beef grazing. Mr Brown is standing down after 14 years as a director of the Alliance Group meat processing cooperative when its annual meeting is held in Oamaru on December 17. Waimate southdown stud breeder believes stockmanship plus record keeping, pedigree and understanding what is behind the animal. Topping ram sales provides undeniable satisfaction for Chris Medlicott, only bettered by producing fertile commercial southdowns, writes Pat Deavoll. A top price of $16,000 for a southdown ram at the Christchurch Ram and Ewe Fair is just the icing on the cake for stud breeder Chris Medlicott. Record sale prices are satisfying, but remain secondary to the Waimate farmer’s main drive of producing top commercial sheep. Southdown stud breeder Chris Medlicott had the top price at the recent Christchurch ram sale for his southdown ram Clifton Downs-279-14. Even so there is no doubt Medlicott is good at what he does. Since 1997 he has consistently topped the sales, and in 2003, and again in 2005, broke the world record for the price paid for a sheep. “A lot of the guys I sell rams to were getting 400 lambs off mum a few years ago, and now they are getting 900 lambs. I take more pleasure out of that than the record prices my rams make,” he says. 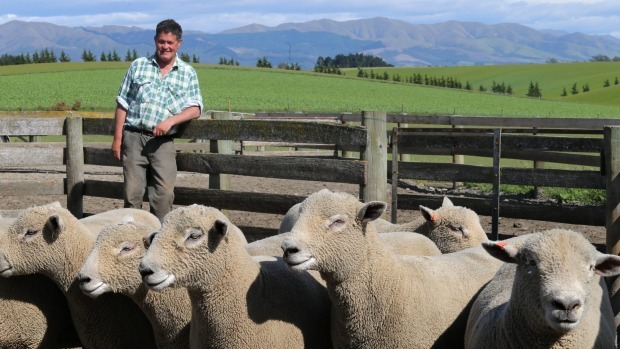 Clifton Downs-279-14 (which topped the Christchurch sale this year) was sought after by several southdown breeders with commercial operations, Medlicott says. “They all said he was the ram they wanted, which I got a buzz out of. They were bidding up to $10,000, then the price got too high and they fell off. Todd and Fleur Anderson (of Winton) bought him. A lot of high growth rate sheep are too lean and not prime enough to go to the works at 14kg, Medlicott says. The commercial farmer needs lots of options because climactic factors like drought or a cold winter can cause delays in fattening lambs. Medlicott has recently merged his own southdown stud, Tasvic Downs, into the Clifton Downs stud, which he took over from his father Bill in 2003. Clifton Downs Stud was started by the partnership of Medlicott’s grandfather Jack, and his father Bill. They were entering the Smithfield lamb competitions, but couldn’t find the terminal sires to produce lambs to do well, says Medlicott. So they started their own southdown stud which grew to become one of the leading flocks in New Zealand. 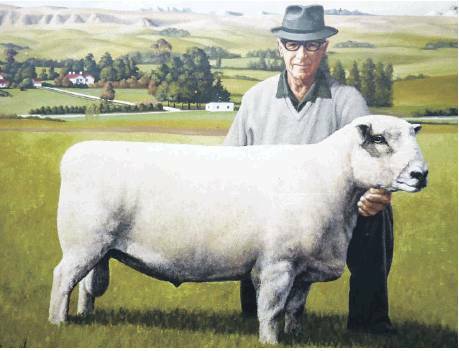 Friends visiting from Australia in the 1970s had bought a ewe at a dispersal sale at the renowned Punchbowl Stud outside Oamaru. The ewe cost $400, a considerable sum of money in those days. It was given to Medlicott, aged 15 at the time, as a thankyou for his family’s hospitality. For a stud to be registered, 10 ewes were needed so Medlicott was given another ewe by southdown breeder John Macaulay, and his father gave him the other eight. “Instead of studying for school cert I was busy looking up pedigrees,” he says. Southdowns rank well ahead of other breeds at the sales, Medlicott says. He says there has been interest in the ram from South America, and the animals “easy-doing” type will be ideal for the native grasses its progeny will be expected to feed on. The ram has good muscle and good growth but has a “soft handle,” Medlicott says. By this he means the animal has a soft muscle, with an even cover, and a little bit of subcutaneous fat. “The world has become “anti-fat,” and New Zealand sheep too lean. There still needs to be a degree of fat for an animal to function, he says. Medlicott has been cat-scanning his rams, and strategically mating the best with a fattier-type ewe. There have been trials done in Australia where a sheep with moderate growth, good handling, conformation and “easy doing” has been getting as good as or better growth rates in extreme conditions as really lean sheep. Southdowns were very popular in the 1950s and 1960s but by the 1970s had become over-fat and lost ground. Medlicott says his grandfather was selling 180 rams a season in the 1960s. A decade later it had got so bad, one year he only sold seven rams. As a stud breeder, Medlicott feels he must always be thinking ahead to where the market is to be profitable. And change needs to be fronted by the leading farmers and breeders. These days southdowns are a popular terminal choice. For good early maturity and “out the gate in a hurry” efficiency they take a lot of beating, Medlicott says. They have created a niche for themselves in Southland, Canterbury and Hawkes Bay. Medlicott doesn’t use estimated breeding valuations (EBVs); I’m “outside the square,” he says. His stud is only about 20 per cent of his income, but it is his passion. In 65 years of farming southdown sheep, Wattie Gray had never seen one of his ewes give birth to a set of quaduplets. That was until last week, when he and daughter Janet Gray came across the brood on the family’s Manawatu farm in Rongotea. “The southdown ewe is only a two-tooth [2-year-old] and these are her first lambs. She was heavily pregnant and I thought perhaps big twins, but I came out and there were four lambs,” said Janet Gray. She and her father said they had seen triplets before, but the quads were a new thing. Some breeds of sheep produced quads and even quintuplets, but four was a rarity among the southdown breed, she said. All the lambs had survived and were sprightly at more than a week old, but Janet Gray said she had mothered two of the four lambs on to two ewes whose own offspring had died. The ewe had three ram lambs and one ewe lamb, which had all been given small, fleecy covers to help keep them warm. She said most lambs born at the stud farm were given such covers.